The old Maine adage, "you can't get there from here," just isn't true anymore. With an airport in every region of Maine, Air Taxi and Charter providers can get you to your destination quickly and easily. Enjoy bird's eye views of Maine's rocky coastline, pristine lakes and quaint villages, while your pilot transports you to your destination. Air Taxi and Charter services provide the speed, reliability, privacy and flexibility not found in any other mode of transportation. A variety of executive jets, from large luxury jets to light jets and turbo props are available with one phone call. Charter services for custom travel are also available throughout the state. For visitors and business travelers alike, air travel in Maine is both fast and convenient, offering a birdâ€™s eye view of mountain and coastal scenery thatâ€™s simply breathtaking. To reach Maineâ€™s remote recreational and wilderness destinations, air travel, either by seaplane or airplane, is often the best choice. Select a region from the tabs below to view charter air service options in that region, Or, visit www.airnav.com for a complete listing of all airports in Maine. Houlton Air Taxi Origin On a visit to Southern Aroostook County, you will find more than you imagined. This rural treasure trove harbors bits of history, acres of wildness, intriguing eateries, and an array of events, all spread throughout some of the most beautiful terrain to be found in the northeast. Belfast Air Taxi Origin The Belfast Area's industries and businesses are as diverse as its people. There is no better example of the traditional craftsmen working alongside the latest technology. Generations of lobstermen work the same waters their forefathers did. Local shopkeepers ensure that the area's small-town New England charm carries on while a healthy economy supported by tourism continues to lure new businesses to our area at a steady pace. Lubec Municipal Airport serves Lubec and Washington County in Downeast Maine. The area affords proximity to the St. Croix River and the Atlantic seacoast. The Machias Bay Area includes Machias and a number of neighboring towns located in Washington County. In this area you will find picturesque harbors dotted with fishing boats, meandering rivers, historic sites pre-dating the Revolutionary War, and bustling classic New England towns. This airport is two miles from Princeton, a small town with a grocery/hardware store, gas stations, post office, bank, boat shop, emergency clinic - and this small airport. Stonington Municipal Airport is a public airport located one mile northwest of the central business district of the town of Stonington. The town of Stonington, reachable by airport or by automobile over a high narrow suspension bridge, features a cluster of quiet communities where fishing is the mainstay of the economy. The spruce-crowned pink granite ledges, quiet woods and open fields, vistas of islands and sparkling water lure visitors from nearby and far away. The Kennebec Valley has strong agricultural traditions. Many of these can be viewed at the Skowhegan State Fair, one of the oldest agricultural fairs in the nation, an annual event since 1819. At the other end of the spectrum, the Maine Organic Farmers and Gardener's Association is hard at work creating a new, million dollar fairgrounds in Unity for its annual Common Ground Country Fair, a three-day event drawing over 60,000 people. There are many Farmer's Markets in the region, and farms raising everything from traditional dairy products to medicinal herbs. Located on 5,000-acre Cobbosseecontee Lake, Lakeside Marina Seaplane Base serves East Winthrop and Kennebec County. Cobbosseecontee Lakes also is home to Maine's only freshwater lighthouse - "Lady's Delight Lighthouse." Maine Instrument Flight flies to over 5,000 airports in the United States. They offers charter service from the Augusta State Airport. 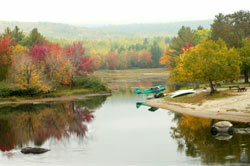 The Moose River Seaplane Base is located on the Moose River in Jackman at the outlet of Big Wood Pond. Landing lanes for the seaplane base are in Big Wood Pond with a short taxi to docks on the river that offer limited tie down space. Note: Find the seaplane base Web page under "Other Amenities." Lewiston is Maine's second largest city and is situated on the banks of the Androscoggin River, midway between the state's spectacular coastline and lush mountains, alongside the Maine Turnpike. Everything is here for a bright new century: visionary civic leaders; a transportation hub connected by rails, interstate highway and air; state of the art telecommunications; a diverse and rapidly growing high precision economy; a vibrant and diverse cultural heritage; superior healthcare and educational services; an energized downtown with architectural masterpieces; safe neighborhoods and affordable housing; an eager workforce, and ample expansion opportunities. From the Brandy Pond Seaplane Base you can view the beauty of Sebago Lake, Long Lake, Brandy Pond, Trickey Pond, the Songo Locks, distant views of the White Mountains of New Hampshire and much more! From the Long Lake Seaplane Base you can view the beauty of Sebago Lake, Long Lake, Brandy Pond, Trickey Pond, the Songo Locks, distant views of the White Mountains of New Hampshire and much more! Exciting experiences can be had by all - whether it's leaf-peeping the Heritage loop, fishing the Rangeley Lakes, white-water rafting down the Carrabassett, hiking Tumbledown Mountain, camping in Mt. Blue State Park, or even spring-skiing at Sugarloaf in your shorts! Floatplanes open the door to some of the world's most remote locations -- experiences that go beyond anything you might encounter on wheels. Twitchell's Airport/Seaplane Base on the Androscoggin River in Turner has been in the business for over 53 years. Knox County Regional Airport is situated on the Rockland coast. It provides air access for passenger and cargo to the islands, as well as commercial passenger service to Boston, and other Maine locations. Wiscasset Airport is a public-use airport located three miles southwest of the central business district of Wiscasset. 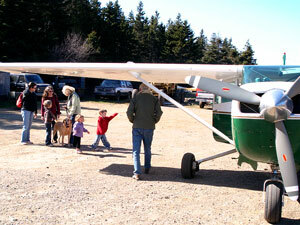 This general aviation airport is publicly owned by Town of Wiscasset. It is currently not served by commercial aircraft, though scheduled air service was once available on Downeast Airlines. As the gateway to the North entrance of Baxter State Park and Aroostook County, the area is abundant with pristine lakes, streams, wilderness and wildlife providing an ideal setting for tourism. Hunting, fishing, hiking, golfing, skiing, snowmobiling, photography and bird watching are just a few of the activities to be enjoyed. Air Taxi Origin The Town of Greenville is located in Maine's Beautiful Moosehead Lake Region. Historically, wood products and tourism have been the business staples in the region. Today, Greenville has several high-tech small businesses and a strong growing tourism retail and service economy. Because of Greenville's distance from other communities of any substantial size and because of its tradition as a hub, the town offers a wide range of services. Flights can be chartered to about anywhere including remote fishing spots in Canada, Labrador, and Newfoundland. Lincoln, Maine is a community of over 5,700 persons located in north central Maine Lincoln's assets range from its location on Interstate 95, state routes 6 and 2, to its expanse of forested lands and 14 ponds and lakes. As the beauty of Maine unfolds below the floats enroute to a remote sporting camp, you'll know you made the right decision to fly in. Highly experienced seaplane pilots will have you at a remote destination in no time so you can enjoy the very best of Maine. Lucky Landing Marina and Seaplane Base offers charter flights to all of Maine's sporting resorts. It is conveniently located ten minutes away from Bangor International Airport. You also can be picked up by air from Portland, Augusta, Rockland or Bar Harbor. Millinocket is a beautiful town set in the shadow of Mount Katahdin, Maine's largest mountain. It also serves as the main gateway to Baxter State Park. Millinocket is a four-season recreational area that recognizes the need to maintain a sustainable economy based on natural resources while protecting our very valuable environment. From the beginning of May until the second week of November, Katahdin Air provides daily transportation to special "out of the way" destinations. These seaplane shuttles are pleasantly convenient, cost effective and personal. In fact, sometimes they're downright mandatory. There are some remote areas in Maine that are only accessible by seaplane or perhaps by foot. Nugent Chamberlain Lake Seaplane Base is located in Township 7, Range 12, where Little Leadbetter Stream empties into Chamberlain Lake, 11 miles NE of Chesuncook, Maine. Old Town Municipal Airport and Seaplane Base, also known as Dewitt Field, is a public use airport located 2.5 miles northwest of the central business district of Old Town. It is owned by the City of Old Town. The seaplane base is located on the Penobscot River. Sightseeing trips over Northern Maine, which includes Baxter State Park and the Allagash Wilderness Waterway, are available from the Shin Pond Seaplane Base.